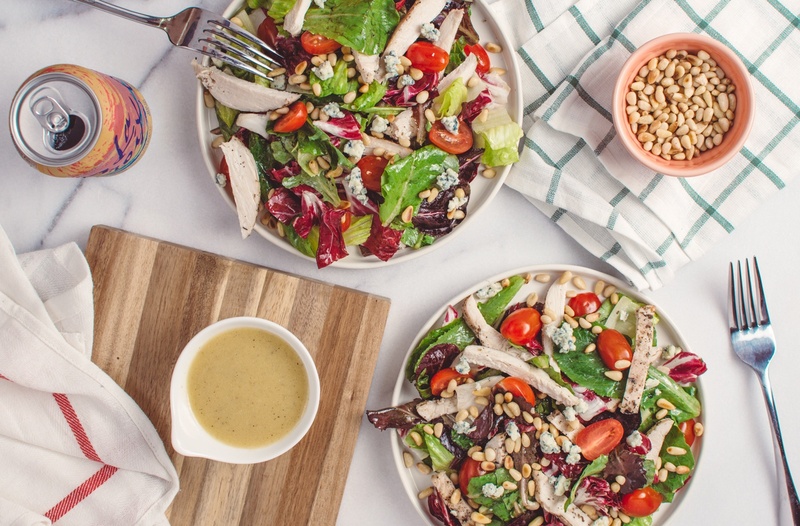 Packing in your daily veggie needs in a big, oversized salad is a smart way to fuel your body—but if you’re not a fan of balsamic, olive oil, or other very minimal dressings, celebrity trainer Tracy Anderson just shared a super-creamy option on Instagram that she eats on the regular that’s all sorts of satisfying. And it’ll only take you about five seconds to throw together. After chopping up her salad—she loves creating a base of kale, cilantro, parsley, arugula, broccoli, and green onions—she uses a quickie dressing hack that starts with a store-bought fave. Instead of dousing her salad with her beloved bottle of OrganicVille’s Miso Ginger Salad Dressing, she just pours a tiny bit into a bowl. Then she mixes it with some other staples to up the taste and texture: a scoop of eggless Soy-Free Vegenaise “to make it creamy,” a tablespoon of water, the juice of half a lemon, and some capers. When you’re done, you’ll have a much-lighter version of a Caesar dressing that’s totally dairy-free, vegan, and bound to make you want to devour your entire bowl of greens. Plus, if you want to prep some for the week, mix up a larger amount and store it in an air-tight Mason jar in your fridge. It’s as easy as that. Need a fitness reset? Try this total-body toning workout from Tracy Anderson. Or, do her J.Lo-inspired cardio routine.